Planning a dinner party? An important business meeting? A weekend camping trip with the guys? Half the battle is finding a date that works for everyone involved. The aptly named WhichDateWorks.com is a free service that makes simple work of finding the best time for a scheduled event. All you do is enter a name for the event, then the e-mail addresses of those involved (WDW can import names from Gmail, Outlook, Yahoo, and just about any other source). Next, work your way through the calendar, clicking specific dates that do or don't work for you. 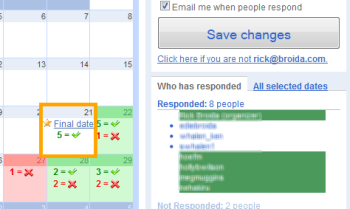 Each time someone answers an invitation, you get an e-mail notification so you can revisit the calendar and review the results. When all is said and done, you can click Final Date to lock in the popular choice and notify all the participants. WhichDateWorks works like a charm. It's free, easy, and an ideal way to get everyone on the same date page.